Theresa May's greatest mental incapacity – apart from her general dimness – is her lack of strategic vision. We have all read her tactical laundry-lists of things to be fixed, all heard her endless sloganizing, but who can remember any expression, any hint, of a strategic goal? Slogans such as 'countering terrorism' or 'enough is enough' are not strategic goals – they are no more than words. A strategic goal has to be overarching and the route to its attainment must be a set of achievable tactical goals. If tactical goals are not embedded in strategic goals, they are just entries on laundry-lists. The United Kingdom under the triangulators, the trimmers and sloganizers of recent decades has had an awful lot of those. The national debt is nearly £1.9 trillion. It grows at a rate of £5,170 per second. The debt burden is 86% of GDP, more than double what it was pre-2008. Public sector borrowing is £51.7 billion this year – that is government overspending by £1 billion a week. May’s manifesto already kicked the deficit reduction can down the road to 2025, ten years later than George Osborne’s original so-called austerity programme. How far has the UK got with the implementation of this critical strategic goal on which everyone can so easily agree? Nowhere. Forget it. It is not even being discussed in polite circles, never mind implemented. Brexit is being treated as one more laundry-list of items that has to be negotiated. However, Brexit is just a tactical part of a much larger strategic goal. The amount that Britain will end up paying to the EU for its freedom and the trade terms that will be agreed are important matters, but they are still only tactical goals. The real strategic goal is the re-establishment of the United Kingdom as a sovereign nation, any Ukipper will tell you that. That's why no one listens to Ukippers anymore. However, what a Ukipper will probably not like to hear is that the sovereignty of nations is to a large extent circumvented by the need for nations to live together in peace and economic harmony. States that are not basket-cases cannot simply do whatever they want. The interdependencies between states is sometimes called globalisation, but it is really only technological and economic progress. At the most trivial level – though, in fact, crucially important to a large majority of citizens – phones, computers, TVs etc. have to work everywhere. We forget how many agreements, accords and standards have to be implemented in order for cooperation to happen. Not just on the technical level but also on the legal and administrative levels, too. I remember only too well a time not all that long ago when my German mobile phone (about the size of a shoebox) was nominally required to be sealed by Customs authorities on certain borders, because no one had yet worked out the international protocols for channels and roaming. Most Customs officers I met really couldn't be bothered with such nonsense and chose not to ask the right questions. Experienced border crossers know when a question is not being asked and never volunteer information without a preceding question. On that pragmatic level the problem was solved until a proper solution came along. A sensible sovereign nation would not give a second thought about the implicit restriction of its sovereignty by such agreements, so great are the mutual benefits from these tactical decisions. As far as Brexit is concerned, we would hope that all the parties involved have plenty of technocrats working on the solution of all these tactical issues. Other aspects of the strategic goal of sovereignty are much more serious decisions that require vision. And vision is ultimately having an idea of where you want to go. For thirty years or more the United Kingdom folded its hands in its lap and followed the will of the European Union in its external affairs. National embassies are being closed down or consolidated and being replaced step-by-step with European foreign office representatives. For thirty years the UK has been able to state its strategic foreign relations goal very simply: 'to be a member of the EU'. When the UK becomes a sovereign state it is going to have to reformulate that goal. It would be nice to hear some discussion in the counsels of the wise about that reformulation. Let the UK have some symbolism to represent that new identity and to keep its citizens and politicians focused on higher things. Take the figure of Britannia out of the dark cupboard to which she was confined half a century ago, dust her off and start to talk about the UK as a sovereign nation without shame. It is a gesture, true, but an important one, a unifying one. 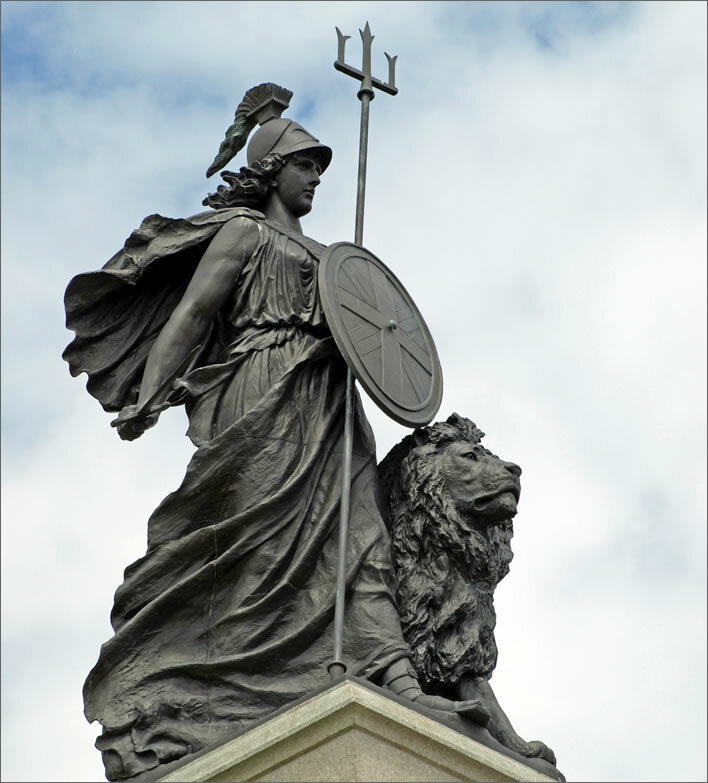 The figure of Britannia will trigger much grumbling from those viscerally opposed to the nation's past, but that is grumbling that has to be countered and defeated if this new nation state is to arise intact. Stick a fine statue of her on the empty fourth plinth in Trafalgar Square, thus also getting rid of the confused products of confused contemporary artists that have occupied that spot for nearly 20 years, symbols of the nation's own indecision and confusion. The fine statue of Britannia by William Charles May on the Armada Memorial at Plymouth Hoe. The monument was erected in 1888, a time of national confidence, by public subscription – no taxpayers were harmed in this process. Image: Mageslayer99. The USA is the measure of all things in the world at the moment. For reasons of shared language and history the USA is the United Kingdom's obvious ally. The UK, a small nation adrift at the edge of the Atlantic Ocean, needs allies and friends and the US is the obvious partner. Even though we can never be equal partners, mutual interest can hold the two together to mutual advantage. The same can be said to a lesser degree for all the other anglophone countries of the world. Other countries, the EU, Russia, China, South Korea, Japan etc. can be reliable partners too, but without the intimacy of the anglophone bond. This view of the overriding strategic goal of foreign and economic policy for a sovereign United Kingdom seems so obvious that the reader is probably already bored stiff by these ponderous platitudes. But if this is so, why have relations with the USA got so bad that President Trump is currently considering postponing or cancelling his planned visit to the UK? Why is it that the new UK Environment Minister, Michael Gove, despite all his experience at the highest levels of government, can pipe up on the very first day of his employment – that is, without a moment's reflection – and announce in an interview that President Trump has single-handedly imperilled the well-being of the future generations of the world by removing the US from the pointless Paris Climate agreement? That Trump was 'wrong' to do that. Trump made this a manifesto pledge before his election and has carried through on the promise, saving his country billions in transfer payments that would do nothing at all for the climate. Under President Trump the USA takes itself seriously as a sovereign nation. His popular 'Put America First' slogan is actually a strategic goal, well formulated – in contrast to Theresa May's limp-wristed 'strong and stable' vacuity. Gove may misguidedly believe that the Paris Agreement will bring some useful benefit to mankind, but why does he have to define that belief in terms of a direct opposition to the actions of the nation that should be the UK's greatest friend and ally? Having an ally, however powerful, does not mean slavish obedience to that ally. But it does require some tact and diplomacy. There are many ways he could have stated his idiotic faith in the need to do something about CAGW, without causing such problems. What he said reveals how focused his mind is on laundry-list entries and how little he has thought of the strategic position of the UK. But then, his boss hasn't made him do that either. Unless, of course, the tactical game was on an even lower, even more demeaning level, with Gove praising Amber Rudd, the Home Secretary, for her climate wisdom and at the same time throwing sticks into the path of his friend-enemy-colleague Boris Johnson, the Foreign Secretary, who is the one who has to deal with the USA? After Brexit the United Kingdom will become a sovereign country once again and will have to start taking itself as seriously as the USA takes itself in that role. If Theresa May had the slightest capacity for strategic vision she would take her ministers to one side and tell them to behave in accordance with the interests of the sovereign state they will soon represent. It is not going to happen, unfortunately.